The 8thannual running of the Fort2Base race took place this past Sunday under hot and humid conditions. The 10 nautical mile event (which translate into 11.5 land miles) brought in nearly 700 finishers this year. A roll call of hands raised at the start of the race showed that there were members of every military branch represented in this race. This race and its companion 3 nautical mile race raise funds that support the USO of Illinois. When I had signed up for this race I assumed that the race would be run on the same course as it has since its first year. I later learned that due to security concerns a portion of the race course and the finish line would be moved off-base from Great Lakes Naval Base. I was disappointed that I wouldn’t be able to run on this historic base. Race director Beth Salinger told me that she will be working diligently with a new recently appointed base commander to have the race return to its original course for next year. 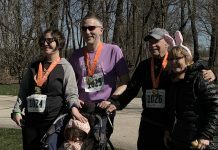 The racecourse starts in Highwood, Ill. near Fort Sheridan and runs north on the McClory bike path running parallel to Sheridan Rd. The course is a scenic one with fewer than expected street crossings to worry about along the way. 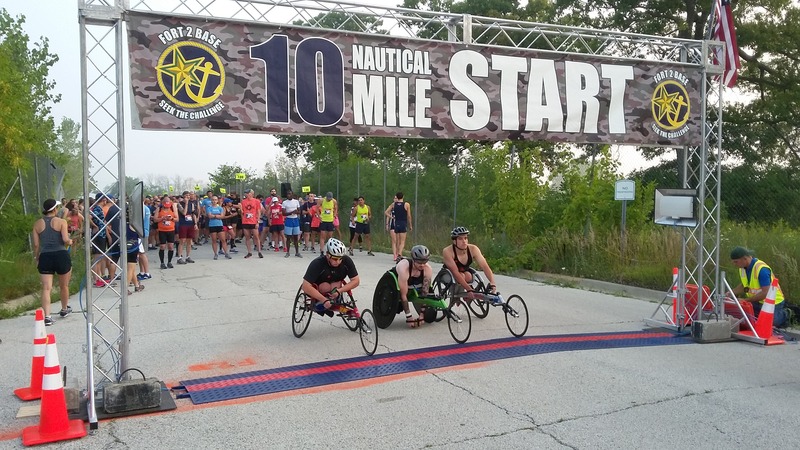 The course takes runners past the Great Lakes Naval Base and north to the finish line at Foss Park in North Chicago. Some of the course was tree-shaded which was a welcome relief from mid 80’s temperatures and the humidity index at 70 percent. I was eagerly looking forward to finishing this race, getting some refreshment and rest when the unexpected happened. About a half mile from the finish line as the course makes its way onto Foss Park Avenue I stumbled and fell hard. This stretch of roadway is filled with craters, cracks, and potholes. I’ve run on plenty of rough terrain without incident but met my match here today. One moment I was on my feet and then the next I’m sliding into gravel tearing up my shoulder, elbow, knee and twisting my wrist. Several runners behind me who saw what unfolded ahead of them came to my aid, helped me to my feet and asked me if I was alright. I let them know that I was more embarrassed about the fall than anything else. One female runner told me it happens to her all the time. Just walk it off she said. That made me laugh some of the embarrassment and pain away. I walked most of the rest of the way to the finish line and then started to run again as the finish line approached so that I could cross that line with some modicum of dignity. After crossing the finish line, I made a bee line through the post-race festivities taking place in the park for the first aid tent in the distance. I received some patching up and medical advice on how to care for my assorted wounds. The first aid staff had their hands full attending to several runners who had breathing and heated related issues. I didn’t want to take up any more of their valuable time, so I thanked them for their help and made my way to pick up some refreshments and watch the awards ceremony. I couldn’t help but keep replaying that fall in my head over and over. It seemed surreal but the pain setting in reminded me it was very real. 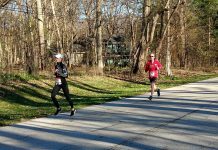 Other than the heat and a sinister portion of the race course I enjoyed running in this event and would run this event again … if the course returns to its original location. I don’t think I want to visit Foss Park Avenue again.